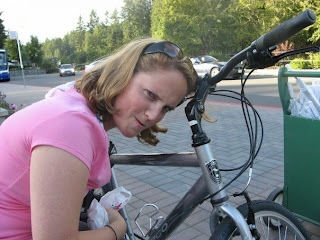 Elizabeth (of Occidental Idiot fame) requested a blog about an experience with either an umbrella or a bicycle. Alas, I have no stories that incorporate both. But this shall be the bicycle story (you may have gleaned that from the title already, who knows?). Back when I was a naïve, happy and freshly-minted college graduate (this would be the summer before I started grad school), my college roommate and lovely friend Liz came to visit me in Seattle. Well, she came west for a wedding, and I happened to be on the way, so we made a vacation out of it. I planned for the mini-trip for a month or two in between working 60+ hour weeks as a swim coach, lifeguard and jack-of-all-trades at the local pool, and I decided that we'd see more than just mundane Seattle…we were going to Canada [insert joke about Canada or Canadians here]. What can I say? We were feeling adventurous, and these things are interesting in the Pacific Northwest. Canada is a novelty. They speak differently, they have socialized healthcare and Mounties…and they’re always coming down to Washington State for concerts and Mariners games. It can’t be too bad, right? Heh. I’d been to Victoria, British Columbia as a kid, and I recalled that it was a pretty sweet place. Plus, it’s on an island. In the Pacific Ocean. And it’s got a very British vibe. Whether that’s an act put on for the silly American and Japanese tourists or genuinely how things are, we will never know. But what’s not to love about a place known for its tearooms, bookstores and massive gardens? Anyway, we decided to go to there, and I had planned it out down to the places we’d stop for lunch and dinner…we were not going to ‘wander’ aimlessly on this vacation! We also decided not to take the car to the island. To accomplish that, you have to pay a ridiculous fee for the ferry and drive a lot farther to get to a different port. So we decided to park the car and walk onto the ferry. Just ourselves and our backpacks on our way to Canada. The trip was fun (lovely weather for the crossing, which took about 2 hours), and before we knew it we were scoping out Victoria’s harbor, the regional seat of government, and making our way to the hostel. Hostel was hilarious, as many of them are: brightly painted, minimal services, loud, and a closet-sized room for all your needs. The mattress was encased in vinyl. YESSSSSSSSS. We had an itinerary, though, and no time to waste! Did I mention the biggest attraction in Victoria? Aside from high tea at the Empress Hotel? 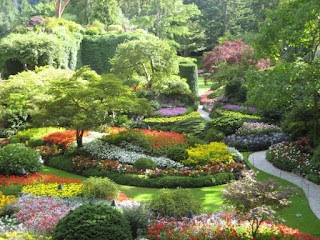 It’s the Butchart Gardens. National Historic Site for Canada, and 55 acres of natural blooming beauty. Victoria’s got a very mild climate, so things will grow year-round (I know, sweet, huh?). 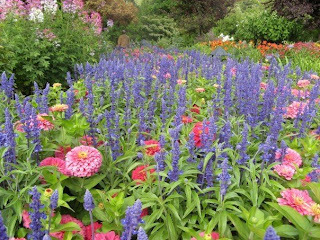 They do multiple re-plantings every season and it’s an absolute smorgasbord for the flower-lover. Thing is, it’s located 17 miles from Victoria proper, on an old family estate. And how were we to get there, you ask? That’s right…bicycle. I’d originally thought to catch a bus, but my mom, who used to be an avid cyclist, convinced me (and by association Liz) that it would be much more fun and scenic to rent bikes for the day and ride there. I think you can see where this is going. We neither of us are/were avid cyclists. The way to the gardens is uphill. We hadn’t planned a definite route, and were directed to ride along the side of an 8-lane highway (with barriers in the middle). We were wearing our touristing clothes and sandals, and had been up since 6am. Cue that melancholy music they always play in sappy movies when nothing is going the hero/heroine’s way. Pardon me, but seventeen miles is a FREAKING long trek! I don’t think I can properly describe the agony that was that ride. I mean, up hills, cars whizzing past at dangerous speeds, rented mountain bikes which may or may not have had broken shifting mechanisms, Liz's asthma…the sheer torture of it all! I’m not exaggerating, folks. We were drenched in sweat, legs burning, Liz I’m sure was inwardly cursing the fact that we (okay, I) listened to my mother, and we didn’t know how much farther it was or if the hills would ever for the love of God and all that is holy STOP!! Check out that hedge, why don't you? Me in the arch. Liz and bike #1. ARGHHH!!! Me. 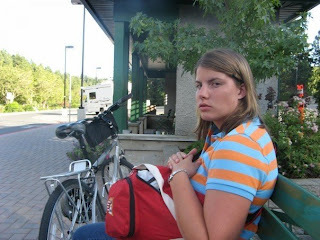 Disgusted with bike #2 while waiting for the bus. The only thing was, we still had to RIDE the bicycles from hell back to Victoria. Or something. Something turned out to be that the local bus cost $2 (or the Canadian equivalent), and they had (glory of all glories!) bike racks on the front of them. We were saved! But we had to catch a very specific bus to be back in Victoria in time to go to our hostel and change and make our dinner reservation. So of course that exact bus shows up with a bike already in the bike rack! The nerve! We begged and pleaded and wheedled the bus driver until he took pity on us poor, silly American girls, and we stowed one bike in the handicapped section inside. With stern instructions that should someone need that seating, we were on our own! We got back to Victoria safely, however, locked rented bicycles in the hostel basement (sketchy! ), and made our way to a lovely, lovely dinner. Where we consumed a bottle of wine between us before weaving our way back to the hostel and much needed sleep. I don’t think it would have been possible to sleep otherwise (it was so loud), except there was no way we weren’t going to crash after that ordeal. Liz and I returned to US soil the next day, and still reminisce about our biking ordeal whenever we see each other. We also vow never to take my mother’s transportation advice again (because you never know, next time she could have us riding ostriches. Or alpacas!). What a story! And I am all for making canada jokes, hahaha. you are too funny... and i totally remember the veiled comments when you came back "why did we listen to your mom?" anyway, it's a story, and you laugh about it now--which means your life is better for having done so. That is hilarious! My husband is a cyclist and I know better than to take his word about how "easy" bike trips are. He commutes on his bicycle most days (24 miles one way) and goes for 100+ mile rides on some weekends. Yeah, he's crazy! Heh, having lived here for quite a while now I can say that I loved your post about my fair city. I did chuckle at some of your comments though. Almost everyone in the Pacific Northwest has the same accent. Idahoans do tend to say crik instead of creek and rough instead of roof but I don't know that I consider them to be Coasties. The British vibe is a carryover from our "colonial" days and in some ways the city is more British than the UK. You were smart not to bring your car on the ferry though. It's quite expensive, as are our other tourist traps, The Empress and Bucharts. 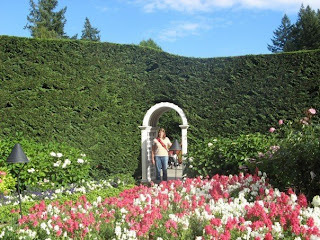 We have great hiking, Beacon Hill Park, historic houses and monuments as well as a great arts and music scene. I feel bad about the bikes though. Bucharts is way the heck out in the middle of nowhere, having originally been a quarry. Also, was the hostel painted yellow and did it by any chance have the word "turtle" in the name? If so I walk by that bright sucker every day on my way to work. Funny thing is, you're dead on. I'm going down to Seattle in a few weeks for a family reunion and my mom's trying to score some Mariners tickets.